APIs are evolving and changing the way developers build. Essential to any sort of application, they are driving our increasingly interactive and integrated software world. The technology stack you choose for the APIs that will power your applications need to ensure interoperability, scalability, reliability, security, performance and global reach to provide a great experience for both developers and customers. 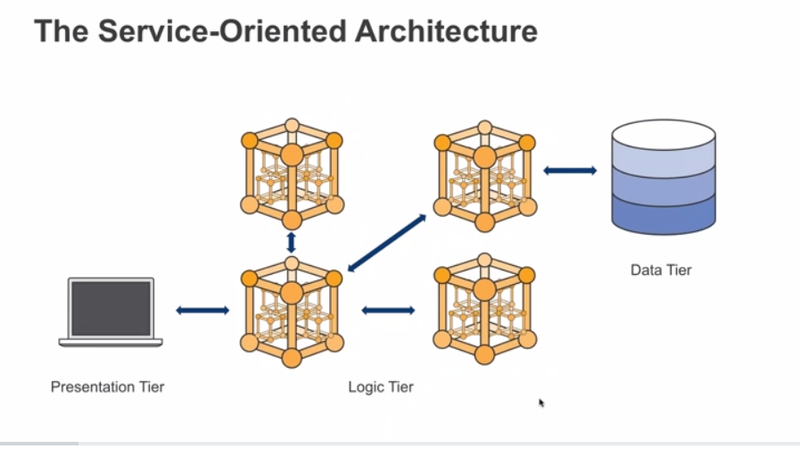 AWS Serverless Technologies inherently tick all of these boxes while removing the undifferentiated heavy lifting of maintaining and operating different types of application backends. AWS offers a number of tools and services that can help not just in creating and operating the APIs, but also in building a community around them. In this webinar we’ll discuss some of the latest releases and new features in the AWS Serverless ecosystem that can help supercharge your APIs at scale as well as discuss architectural patterns, deployment tools, implementation concepts, technologies and services for different use cases with different event sources such as data streams (Amazon Kinesis), queues (Amazon SQS), notifications (Amazon SNS) and others. We’ll also have a very special guest: Vanessa Thornton. Vanessa is a Senior Engineer in the Developer Ecosystem team at Xero. Xero build beautiful accounting software and a platform for small business. Started in New Zealand in 2006, they have grown to more than 1 million subscribers. They also have a thriving API ecosystem with over 700 certified partners and 40,000 developers building to their platform. They are now one of the fastest growing SaaS companies globally. Xero will share their experience and use case building and implementing APIs at scale on AWS using Serverless Technologies. Learn how to build and implement Serverless APIs at AWS, how about global active-active multi-region APIs? Chatbots are most commonly used as a feature of mobile or desktop websites, where text is used for the primary interaction method. 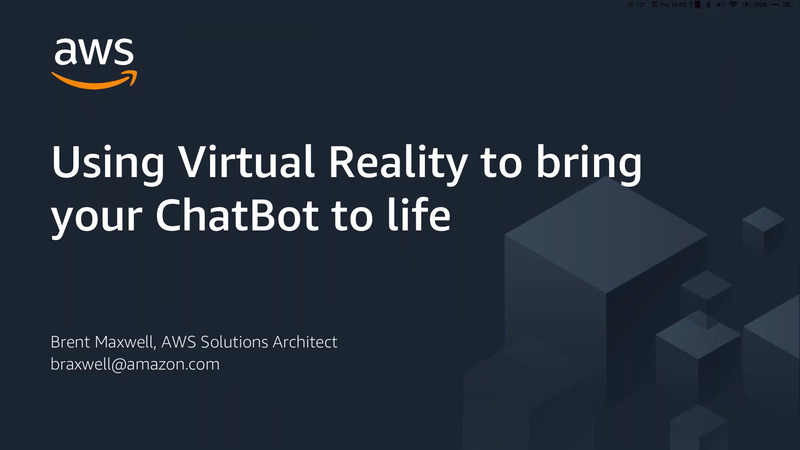 In this session we’ll explore how you can use Amazon Sumerian to create a virtual host that can be interacted with through virtual reality (VR), augmented reality (AR) or just as a digital character. This makes voice a far more natural interaction method. We’ll also look at how you can extend this bot to interact with other rich services in the AWS Cloud. 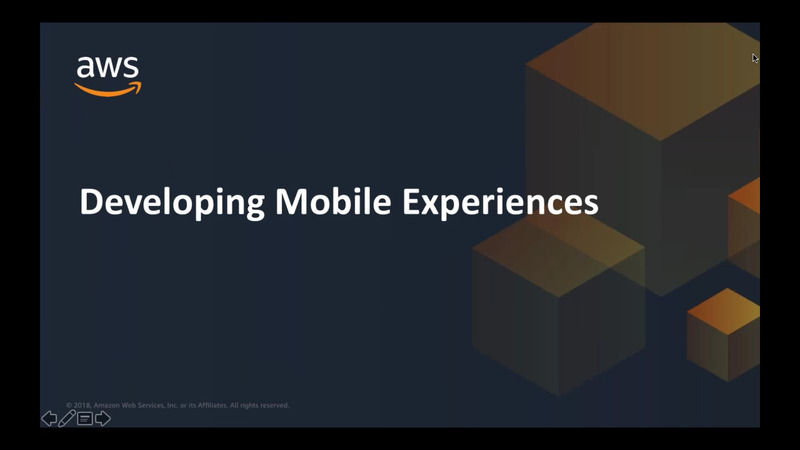 This session will discuss best practices and industry trends for those developing mobile experiences. We will discuss a range of services and tooling AWS offers to mobile developers and business users. These include automated ways to test your apps, gather and gain insights from mobile analytics, and authenticate your users. The session is ideal for those considering or currently building web-based and native mobile applications. 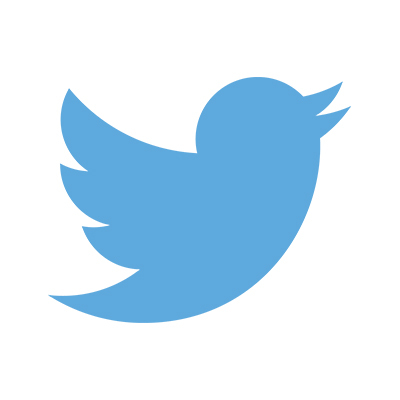 We discuss how deliver more engaging and high-quality apps quickly and cost effectively. 200 level session aimed at business users and app developers with limited awareness of AWS Mobile offerings. Chatbots give customers fast, easy access to information and free customer service agents from mundane, repetitive tasks. Coupled with Amazon Connect, a simple to use, cloud-based contact centre, chatbots can help you innovate your customer service model quickly and cost effectively. But what is the most effective mix of live agent, chatbot, web and mobile interactions for your business? In this short 45-minute webinar, you will learn how, when and why to use chatbots. First, we show you how easy it is to build a new Amazon Connect contact centre. 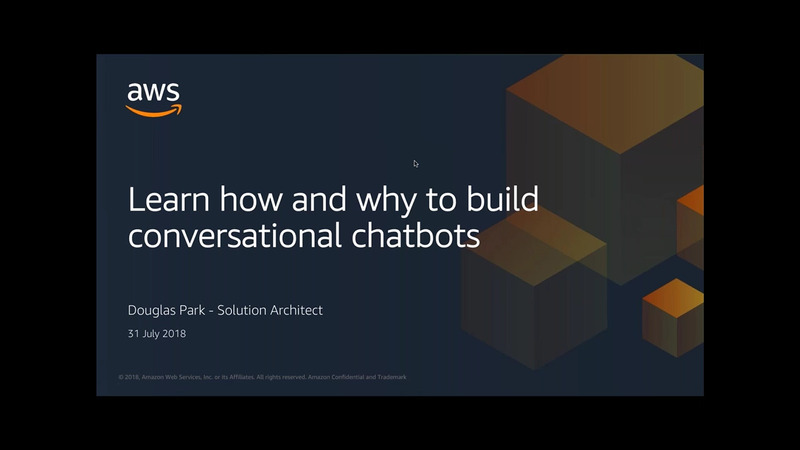 Then we’ll use Amazon Lex to build an intelligent conversational chatbot which is integrated with your new Amazon Connect contact centre workflows. In this webinar we’ll give you an overview the next generation technology for building APIs called GraphQL and how AWS AppSync takes advantage of GraphQL to make it easy to build collaborative mobile and web applications that deliver responsive and enhanced user experiences. Modern developers need easy tools for real time, offline access and synchronisation. These techniques are no longer optional for a great end user experience, yet they are difficult to engineer and scale from scratch. Implementing these concepts with modern data fetching patterns across web or mobile can also be difficult. AWS AppSync automatically updates the data for web and mobile applications in real time and synchronize data for offline users as soon as they reconnect, managing everything needed to store, process, and retrieve the data for your application. 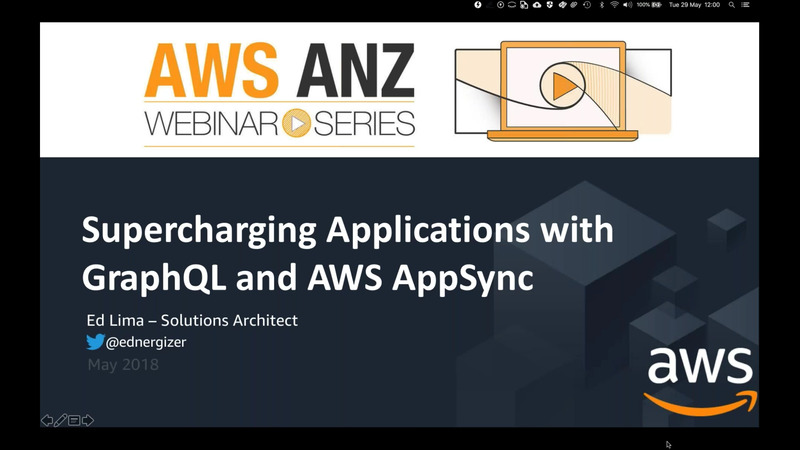 In this session, we will also cover how AWS AppSync allows you to query your data using GraphQL and how it handles mutations, subscriptions, pagination, relations, offline access, real time communications, conflict resolution, and efficient data fetching. 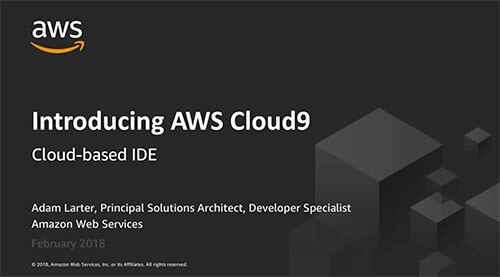 Come learn all about AWS Cloud9, the newly announced integrated development environment (IDE) in the cloud. In this webinar we’ll give an overview of Cloud9 and do a live demo of exciting features and use cases. What if you could build a web application that could support true web-scale traffic without having to ever provision or manage a single server? 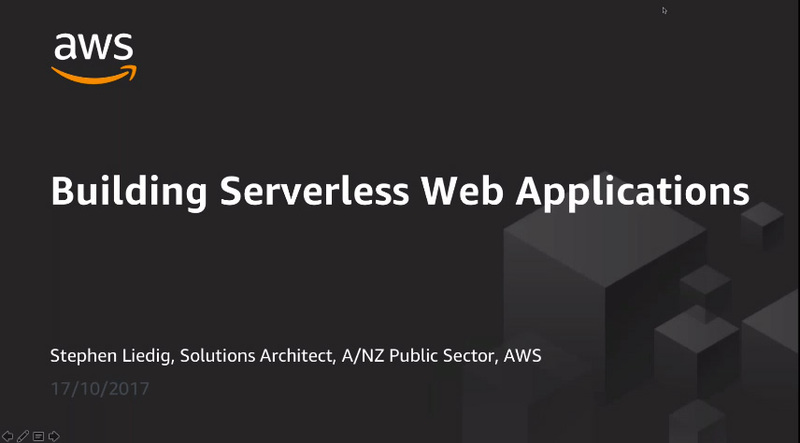 In this session, you will learn how to build a serverless website that scales automatically using services like AWS Lambda, Amazon API Gateway, and Amazon S3. We will review several frameworks that can help you build serverless applications, such as the AWS Serverless Application Model (AWS SAM), Chalice, and ClaudiaJS. Hear how you can build web applications and mobile backends in a faster, more agile way. 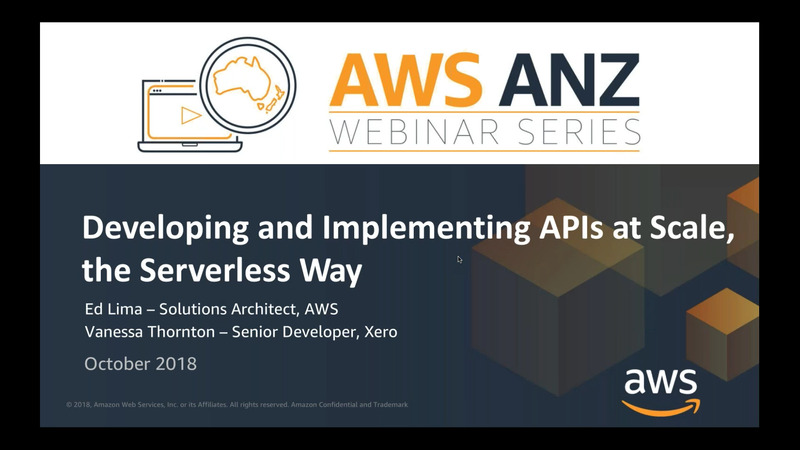 The webinar session introduces how you can use cloud services like AWS Lambda, Amazon API Gateway, and Amazon DynamoDB to implement serverless architectural patterns that reduce the operational complexity of running and managing applications.